Dartcom’s French distributor ACTRIS has been awarded the contract to supply and install a GOES HRIT System at CMS Lannion for Météo France. This will support the forthcoming HRIT service from GOES-16 which is due to start in November 2017. Dartcom has supplied and installed a 1.5m Marine HRPT/AHRPT/LRIT System on the Peruvian Navy’s research ship BAP Carrasco, described as one of the world’s most advanced polar oceanographic research vessels. 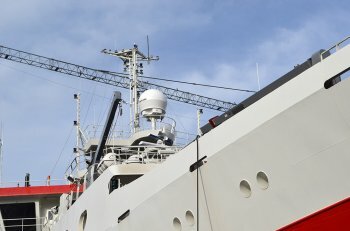 Her operating profile will range from hydrographic, biological, geological and physiochemical surveys to providing support with humanitarian operations. The vessel is equipped with a meteorological office, six laboratories for different research purposes, a helicopter pad and a bathymetry transducer system fitted on the flat bottom of the hull. The 1.5m marine antenna is also available with the Dartcom X-Band EOS System, with a combined X/L-Band option to provide HRPT/AHRPT and X-Band EOS reception in one system. 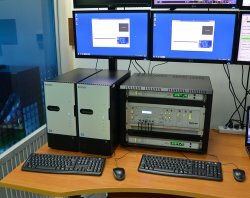 Dartcom has supplied a fully duplicated C-Band HimawariCast HRIT system for Vietnam Air Traffic Management Corporation (VATM). They provide air navigation services for aircraft operating at airports nationwide and over Vietnam’s Flight Information Region. Dartcom has supplied two COMS-1 L-Band HRIT Systems to the Meteorological Forecasting Department of the Vietnamese Navy. Dartcom has supplied a C-Band HimawariCast HRIT System to the National Institute of Aeronautics and Space (LAPAN) in Indonesia. LAPAN use the system to provide near real-time images for the Indonesian National Disaster Agency. Dartcom has supplied a C-Band HimawariCast HRIT System to the Meteorological Forecasting Department at Tan Son Nhat International Airport, Vietnam. Dartcom has supplied a 1.2m L-Band HRPT/AHRPT System to the College of Engineering at Sri Venkateswara University, Tirupati, India. The system was expertly installed and commissioned by Dartom’s premier distributor Satcom Technologies who are based in Hyderabad. Dartcom has supplied a 1.3m Marine HRPT/AHRPT/LRIT system to be used for weather routing on a new 138,000 ton Liquefied Natural Gas tanker being built in Nagasaki, Japan. 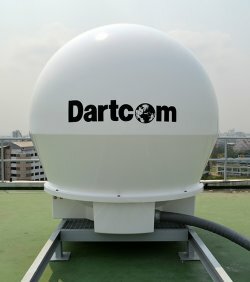 A Dartcom 1.5m X/L-Band EOS System has been supplied to the Faculty of Engineering at Kasetsart University, Bangkok, Thailand and installed at Chulabhorn Satellite Receiving Station (CSRS). The system receives and processes data from Terra, Aqua, Suomi-NPP and FY-3A/B/C satellites. CSRS provides generated satellite products for research and government agencies in areas such as flood and drought monitoring, forest fire monitoring and agricultural management.